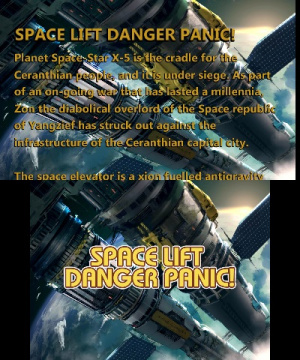 If you're looking for a bizarrely named game that does interesting things with what little it has to offer, look no further than Space Lift Danger Panic! The flagship 3DS eShop title from developer Springloaded, this provides very basic gameplay but manages to combine it with a mysterious and alluring story to balance itself out. This is one that will appeal to fans of arcade-style action and science fiction storytelling, but the biggest challenge that it faces is providing lasting appeal. 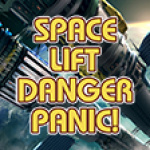 Originally released as an iOS game – an increasingly popular trend these days – Space Lift Danger Panic! implements very simplistic gameplay mechanics, in conjunction with a surprisingly deep plot, to create an engaging arcade experience. Set on the planet Space-Star X5, you take on the role of a space lift operations manager whose goal is to save the Ceranthian people from their impending doom. We won't delve into too much detail because the progressive storytelling is one of the bigger draws of this game, but it's fair to say that the plot goes surprisingly deep into your planet's history and explains how you and your civilization got to where you are today. The plot is fascinating and does well to draw its players in, but the flip side of this coin is that the gameplay lacks any semblance of depth. 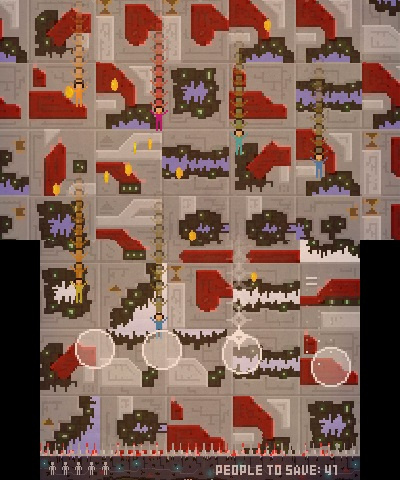 As Ceranthians fall from the top screen into the bottom, your mission is to save them by activating a portal underneath them so they can teleport to safety. It seems like a fun concept, but that's just a result of the clever sci-fi branding. What the gameplay actually consists of is tapping the touchscreen underneath each falling figure, and that's it - the controls work well, but this is hardly worth mentioning as they consist of almost nothing. Coins also appear on screen that can be collected and used to purchase extra lives, but the entirety of gameplay consists of tapping the bottom screen as pixel people fall into it. Once you've delivered the correct amount of citizens required of each level to safety, then the next stage unlocks. There are 40 stages to play through, all of which can be completed in just under an hour. Completing the first five campaign stages will unlock Survival Mode, the portion of the game where most players will find a reason to return. As can be expected, Survival Mode provides an endless stream of falling figures that continues until you run out of lives. It's worth noting that there is an online leaderboard attached to Survival Mode that records your scores and displays the scores of the best players from around the world, so there is plenty of replayability here for those high score chasers among us. The reality is that if the plot doesn't draw you in and leaderboards aren't enough motivation to keep you playing, this is absolutely not the game for you. Space Lift Danger Panic! employs a pixelated visual and audio style that works well to compliment the dark sci-fi tones of the plot. However, much like the gameplay, the aesthetic never changes or grows as you progress further into the story. Stages retain the same design with a changing colour palette from one to the next, and the same song plays in each and every single level. While it wasn't a prevalent problem, in some instances the falling figures blend in with the background colours, making it difficult to even see those we were trying to save. Space Lift Danger Panic! does its best to take repetitive, uninspired gameplay and turn it into something that is actually worth investing your time into. Each stage plays exactly the same, and there's no avoiding the fact that the repetition can quickly grow tiresome, but the sci-fi plot that progressively unfolds stage by stage is implemented in a way that effectively engages its players and draws them in. If you're going to play Space Lift Danger Panic!, there's a good chance that it's going to be for the plot and occasional returns to Survival Mode, but it's a hard sell for players looking for something with a little more depth. It's just too bad that more effort wasn't put into the general gameplay to give it a little variety. Seems like a cross between Missile Command and Game & Watch Parachute. Doesn't really do it for me, but there's worse on the eShop than this. Not too bad considering the price I suppose, but I like to see more originality. we wanted to focus on making a fun, albeit simple game, and I think this review captures what we set out to achieve. Hopefully people will want to give it a try, and can appreciate it for what it is, which is a pure and polished late 70's arcade/atari style experience. Had we been too ambitious, we might have been in a situation where we couldn't complete the game on time, or would have had unfinished and sloppy mechanics. Fritz is pretty much spot on with the parachute / missile command comparison (although I never actually realised it was like missile command until people pointed it out to us this week). Both are great games, and it's fine by me to get compared to them. I think considering the scope of the game, I can understand the score, but I also want people to know that we set out to make a really refined, and very focused product, that should be a lot of fun for the short time it lasts. We have been hard at work on our second 3DS game for quite a while now, and hope to submit it to Nintendo soon! (for a hopeful release around Valentines day). The game is called Heart Beaten, and while it shares the name of a mobile game I made a couple of years ago, the 3DS game has almost nothing in common with the original as far as content and game code goes. I'll probably get this on my smartphone for 0.74€ then. The 3DS version is pretty different from the smart phone version, the levels are rebalanced, and in general the thing is a lot more polished! but I can understand why you might feel this way. 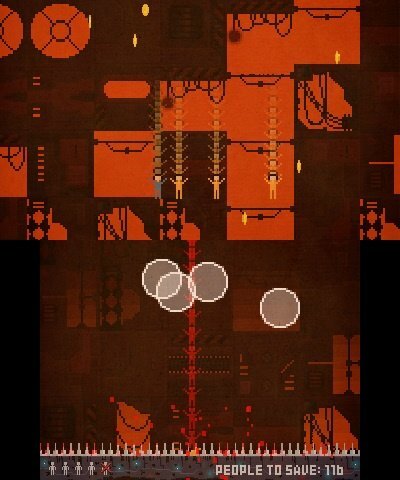 Looks funny, and addictive. As long as I am weak against retro styled games, I will give it a shot... if it comes to Europe ;( And it looks like this game is asking for rhythm based stages. @Springloaded Great to see a developer engaging directly with their audience in a professional and enthusiastic way. I might give this a go. Excited for Heart Beaten, too. @LittleIrves Indeed couldn't agree more. The passion of this man drips of his writing, quite awesome to see. Not interested at the moment due to otherwise engaged, but I might pick this up just to support.